23rd August. A day before this date, I posted about my dissatisfaction with the Power Company and the discomfort I feel whenever I haven’t written anything in a day. It’s funny how you hardly get power, yet you keep paying the light bills to prevent the power company from cutting you off. My light bills were due for payment; I left home that afternoon to pay the bills. After the payment I had little cash left, so I went to the bank to withdraw some money. I'd have used an ATM if I had my ATM card with me. But fate had something in stock for me. I still remember that day clearly. I flagged down an okada (motorbike used as a transport mean) when I left the bank, gave the rider my home address. The crash happened one kilometer away from the bank. We were riding past a parked car when the driver suddenly opened his door, and we crashed against the car. I saw myself tossed into the air like a ball. I got up immediately after I landed on the ground. Maybe it was the adrenaline in me at that moment. Maybe I didn’t want a vehicle from behind to run over me. Or maybe I didn’t want to become a victim of road accident. But whatever it was, I didn’t spend more than a second lying on that scorched, cracked narrow road. I stood up immediately, but realized something was wrong when I wanted to walk to one side of the road. Then I saw it; my leg, in an awkward twisted shape. Not knowing what to do or how to react, fear flooded my mind. The first thought that came to me then was that I was pretty screwed up. Then the devils came: ‘you’ll never walk properly again! Your leg is going to be cut off! Your life’s now a mess!’ At that moment, I thought about my life, my dreams, my family, and my friends. I realized I hadn’t achieved much. I was sad. By then a little crowd was already gathering around the scene. 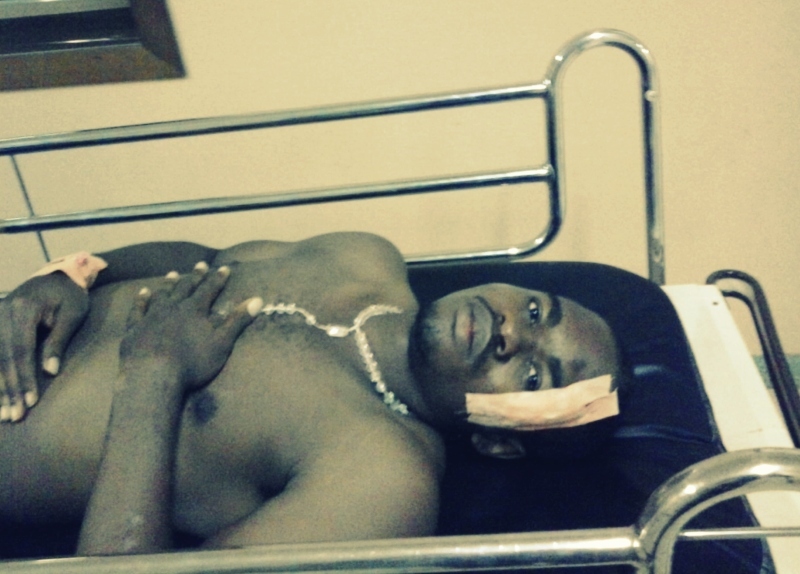 I wiped blood, sand and sweat off my face while I leaned on the car that had caused the accident. Just then I realized the people didn’t think it was a serious stuff – maybe because I wasn’t screaming or maybe my face wasn’t twisted in pains – when a man told me to walk to one side of the road. That sentence, like a magic spell began arguments between the driver of the car, the bike man, and the people gathered. They were arguing about who was or who wasn’t at fault. Only then did I learn that the driver of the car hadn’t checked well before he opened his door. I didn’t care about their arguments. I was feeling the pain now and all I wanted at that moment was for the pain to go away. If it were possible, let me wake from the nightmare. I have witnessed many road accidents and I couldn’t believe that I was its victim today. After much argument, two men carried me into the car and drove me to Nnamdi Azikiwe University Teaching Hospital (NAUTH), just two hundred meters away from the accident scene. What baffles me until this day was a statement the driver made before I was taken to the hospital. When asked by the people around to carry me in the car to the hospital, he complained about my blood staining the interior of his car. Somehow I felt worthless then. Here was I, in pains, bleeding, and someone’s priority at that moment was the car he drives. It reminded me I was still in Earth, and not in some utopia where everything was fine. In the hospital, I was wheeled to the emergency ward. A doctor and two nurses attended to me immediately. They gave me some anesthetic – which really didn’t work – then proceeded to stitch the wound. Within minutes they wrapped a cast over my leg, then wiped and put a plaster over the wound and bruises on my face. A friend of mine came over to the hospital to stay with me and in the evening, I went for an X-ray. Going for X-ray. My friend took the picture. That night was hell; I couldn’t sleep. I’m not the type who would feel comfortable around many people. And the ward was a big one with lots of sick people and fresh accident victims in it. I would have given anything for sleep at that moment, but the pain in my leg overshadowed everything else, which made me beg for more anesthetic, or anything at all that could stop the pains. My friend was a good help that night and even the days beyond. Night passed. But I was awake throughout. Second day in the hospital, family and relatives started pouring in to commiserate with me. Some brought fruits and other goodies I didn’t care about at that moment. In fact, I began to wonder how they wanted me to consume those stuffs. Some of my friends and relatives came to visit me there, and it got to a point when I couldn’t just help but feel sorry for myself. Sometimes I tried to imagine myself from their eye-view. Adhesive plaster on my face, bandages and sticks tied against my right leg, I must have looked pathetic. But Despite I committed myself into God’s care as I started the slow journey of healing. There were times when the bad mood comes and I just get angry at everything and sometimes even question God why this would happen to me. I also learnt that a fracture takes time to heal, especially as affected by age or individual body system. I met new friends and patients in my new ward. One of the patients was a remarkable young man, Mr. Charles Nwuju, a man whose experience I used to console myself whenever the bad mood or self-pity came. Charles was riding a tricycle, three passengers seated at the back. Among his passengers was Augustina, his fiancée. They were on the highway when suddenly a pick-up truck overtaking a trailer collided head-on with them. Two persons died on the spot. The driver of the truck, waist fractured, died few days later. Charles, unconscious, was taken to the hospital. Augustina, flung into the nearby bush, wasn’t discovered until the next day. As Charles would later say, their survival was a sign from God that they were meant to be together. Charles spent five days in coma, oxygen, blood, and drip attached to him. 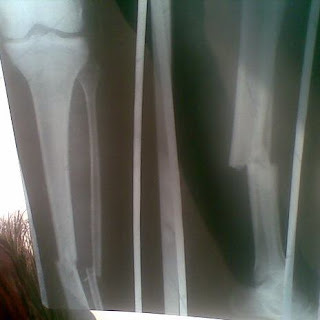 He had four fractures; one in the right hand, his two femurs (thigh bones) and left fibula (lower leg bone). 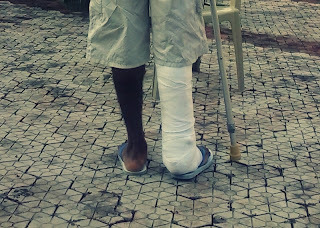 When he was still in that hospital, his brother got wind of an amputation to be carried out on his left leg. Knowing that Charles won’t be happy ever if he wakes and finds his leg amputated, he applied for a discharge and then brought Charles to Chukwujekwu Traditional Orthopedic Clinic. Today, Charles uses crutches and he’s improving faster than anybody thought he would. I heard many accident stories during my stay in the clinic. I also learnt that the spot where I had the accident was a well-known accident spot in my hometown. Two months before my accident, a man and his pregnant wife had a crash there. A caterpillar working on the road ran over the woman. She was dead before they could rush her to the hospital. So were the twins in her womb. I felt very bad when I heard the story, and when one day the husband of the woman, who was also treated at Chukwujekwu’s came to my ward to know how we’re faring, I didn’t feel bad about my condition anymore. I sympathized with him instead. October 9th, after six weeks and five days of lying and sitting on one spot, the doctor gave me some crutches, and I began to walk again. I call that day Miracle Tuesday. The doctor discharged me five days later. Now I go for weekly check-ups. During my stay in the clinic, my normal life was disrupted. Apart from writing in my diary, I never wrote anything else. I could hardly read books because I couldn’t concentrate, especially due to pains. Music was a good help. Prayers too. I’ve learnt many things since then. Three weeks before I posted this, I dropped one of my crutches. Soon I’d drop the second one, then begin to use a walking stick. With time, I’ll walk normal like before. Thanks for reading this. Big thanks to God, my family, friends, and everybody who supported me through this experience. Love you all. Wow, Kaykay. I'm so glad you're okay, despite everything. Thank you for sharing your story, and the stories of the people you met during your stay at the hospital. I feel so bad for those families, yet how you've described them just shows so much strength of character and goodness, despite the odds and the suffering they've experienced. Juxtaposed against that driver who only cared for his car, or those who just argued about fault while you were there with a broken limb... wow. Again, so glad you're okay. Thanks for reading, Megan. I actually didn't want to share the story. But I decided to. At least readers gotta know what kept me off blogging for sometime, and somehow it serves like a bigger diary. Thought as severe are your situation, I ruptured my achilles tendon playing soccer and have been stuck at home for 3 months, unable to walk and move about. it's a long road to recovery, but 4 months later, I'm back at the gym doing the bike and walking at 100%. The good thing to come out of it was that I spent a lot more time on my writing and finished a book, which I'm launching fairly soon. Thanks for the comment, Patrick. It's six months now and I'm almost better. Not 100% better though, but I'm grateful the crutches and walking stick are things of the past. Yeah, the positives are that I completed the third book in my YA Urban Fantasy series. And I'm reading a lot of books nowadays.